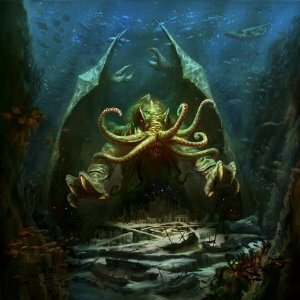 The reason for Cthulhu’s scarcity is most likely due to both Lovecraft’s preference to suggest horror rather than show it outright and the phrase “Ph’nglui mglw’nafh Cthulhu R’lyeh wgah’nagl fhtagn.” Those who have read the “The Call of Cthulhu” know that it means which translates as “In his house at R’lyeh, dead Cthulhu waits dreaming.” As a being who can only awaken “when the stars are right” to destroy the world as humanity knows it, it makes little sense to have Cthulhu constantly awakening. Having a human protagonist repeatedly defeat him would destroy all sense of the Great Old One’s menace and having Cthulhu fulfill his destroy would drastically reduce the amount of stories that could be written in the same universe. No, it is far better to have Cthulhu wait silently in the background, as the idea of his rising is far more frightening than a story about it could ever be. “From the Parchments of Pnom” by Clark Ashton Smith is more of a description of the contents of a fictional book than it is a story, but it does offer some insights on Cthulhu, including a family tree! Although sadly incomplete, the preview for Ian Watson’s “The Walker in the Cemetery” is enough to whet the reader’s interest. Like all the stories in the Cthulu’s Reign anthology, “The Walker in the Cemetery” deals with what happens to the world after Cthulhu rises. However, this story is unique in its depiction of Cthulhu. Not only does it feature multiple aspects of Cthulhu in various sizes, but a seven foot tall one traps a bunch of tourists in a never-ending Genoan cemetery and starts to slowly pick them off. Just keep in mind that it comes off more as a 80’s European gore movie (with some Rose of Iron thrown in for good measure) rather than a straight Lovecraft story. Nick Mamatas’ full-length novel Move Under Ground also deals with Cthulhu’s awakening, this time done in Jack Kerouac’s Beat style. In fact, Kerouac is one of the main characters! Neil Gaiman takes things in a more humorous direction in “I, Cthulhu.” In it, Cthulhu tells his life story to a servant with a very familiar last name. Although Cthulhu only has a minor appearance of sorts in Bruce Turlish’s “The Final Pronunciation,” the importance of it cannot be denied and it has dire consequences for everyone involved (although not in the way one would expect). Thanks to Fantasy Flight Games and Cyril van der Haegen for use of the image!